Sorry, Kailyn! Javi Marroquin’s New Girlfriend Is Pregnant! There's a new baby coming! 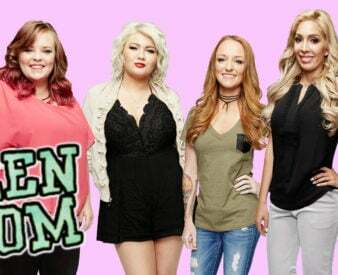 At this point in most of the Teen Mom stars’ lives, pregnancy announcements are to be expected. Many of the cast members are in stable relationships or married, and on top of the fact that they all have homes and stable incomes, they’re all also well into their twenties! That means that a pregnancy won’t shake up their lives nearly as much as it did when they were sixteen. But there are still bound to be some pregnancies that totally shock fans. When Amber Portwood announced she was pregnant by her new man, Andrew Glennon, fans were completely blindsided. Now, Javi Marroquin is giving her a run for her money! When Javi got back together with his ex-girlfriend, fans were surprised they were able to work things out. Still, no one was entirely sure they’d be in it for the long haul. Well, now they absolutely will be! Javi has just revealed that he’s gotten his girlfriend pregnant. We know Kailyn’s not going to be too happy about this! Keep reading to check out a behind-the-scenes take on Javi’s secret relationship! Right now, Kailyn Lowry has a very blended family. She has three sons (Isaac, Lincoln, and Lux) all of whom have different fathers (Jo Rivera, Javi Marroquin, and Chris Lopez). This means her children have a lot of half-siblings, step-parents, and a very wide and growing family tree. Now, there’s one more little baby who will be joining the equation. Of course, it takes two to tango. So who is his baby mama? Javi Marroquin has locked it down with his on-and-of girlfriend, Lauren Comeau. Fans will recall that his previous relationship with her put some tension on his co-parenting relationship with Kailyn. The two began dating long-distance after meeting at a wedding. Javi was in Delaware while his bae lived in Charleston, South Carolina. “We met at one of our best friend’s weddings,” Javi told Radar Online. “She was the maid of honor.” He revealed that their relationship was “fairly new” but that he “[didn’t] feel that way.” (We all know that Javi is an expert of moving super fast in relationships.) “This one feels right. We decided we’d give it a try officially at the wedding this past weekend.” Lauren was also the fourth girl he dated in the year after he split from Kailyn. Unfortunately, their relationship didn’t last very long. The stress of having a public relationship was too much for Lauren, and the couple split in September of 2017. Even though they only got together two months ago, they clearly didn’t waste any time. Javi has just confirmed to Radar that his girlfriend Lauren is pregnant (yes, with his child). But fans weren’t able to keep it so concise.